Hello darlings! Long time no post huh? I feel terrible that I have not written anything in a few months, so what better way to make me feel better that a jewelry post! This past weekend I received press passes to attend the New York Antique and Fine Jewelry show at the Metropolitan Pavilion and the JANY Jewelry Trade show at the Jacob Javitz center. 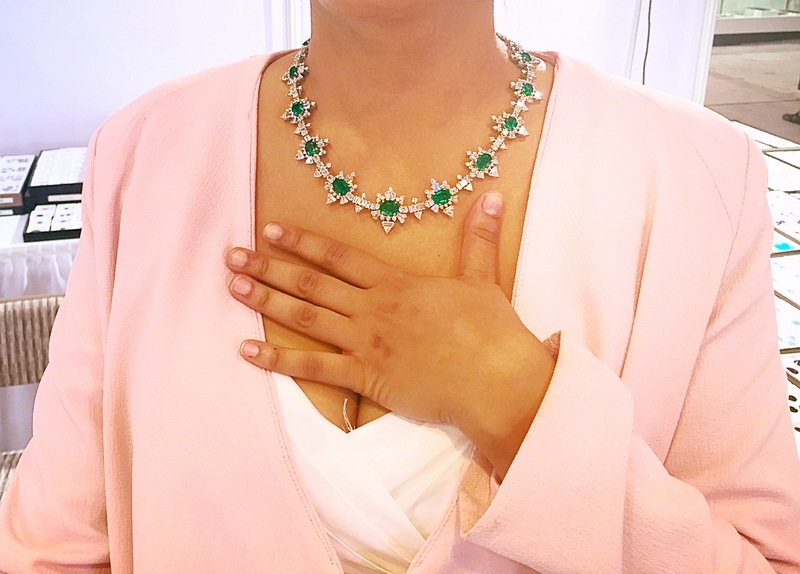 It was two days packed full of 18th century old mine cut diamonds the size of goose eggs, South Sea pearls, Brazilian and Colombian emeralds that looked like green pieces of candy and design inspiration all around. This piece was the first to catch my eye. 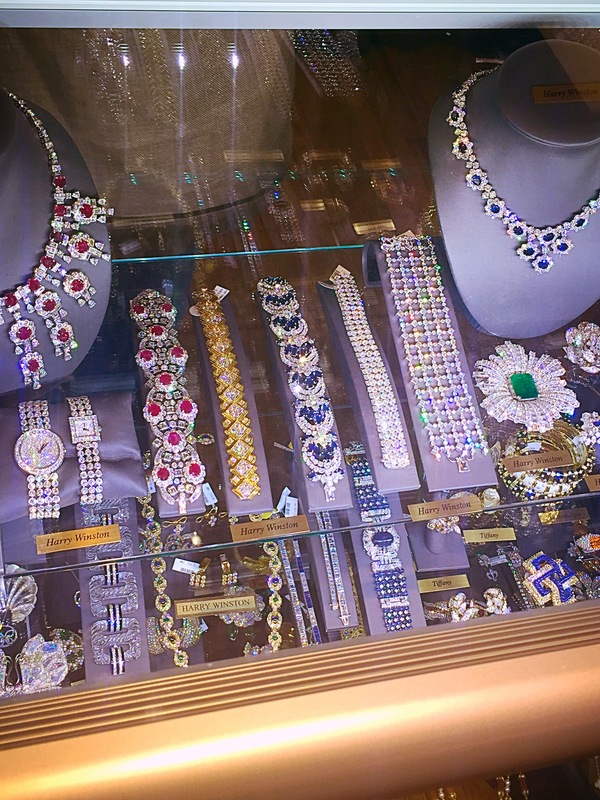 With its Indian influences featuring beautiful emeralds, freshwater pearls and diamonds sets in white gold it was a great way to kick off the show. 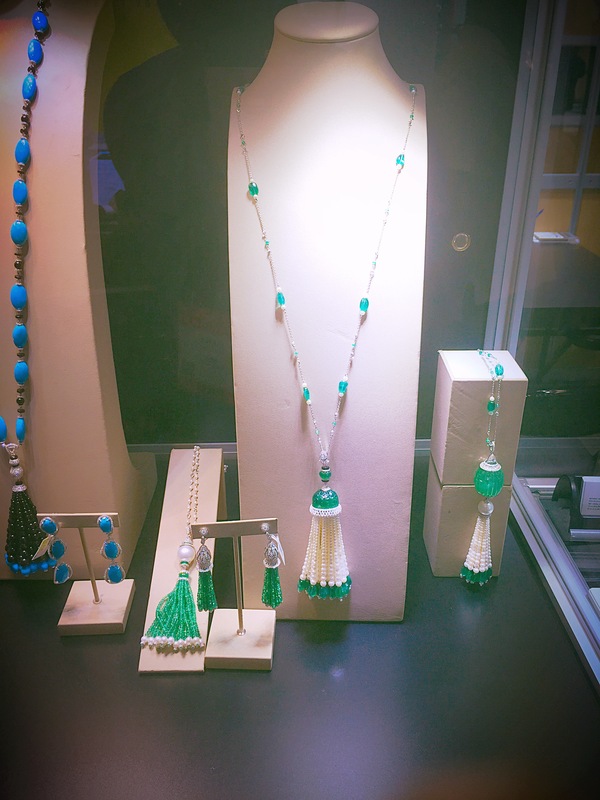 The show began with a beautiful set of white gold tassel necklaces done with diamonds, smooth green emeralds and pearls. The shows themselves were very vast, filled with vendor upon vendor eager to present his treasure trove. One mistake I made was showing too much interest in a particular diamond feather brooch, upon after which I read the price tag of $15,000 I quickly walked away chuckling to myself lol. 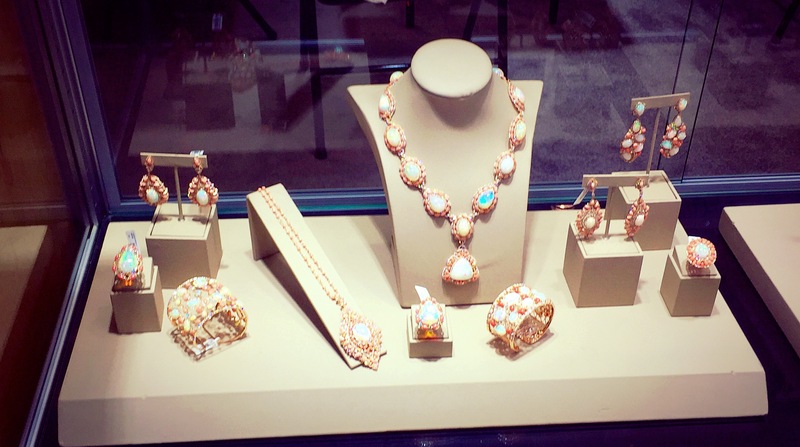 A display featuring a glittering array of pieces with classic charm. My favorite is the Art Deco emerald and diamond brooch by Harry Winston. Harry Winston without a doubt is one of my favorite houses when I think of classic jewelry design. This display was filled with fabulous pieces including a few by Tiffany & Co. This young girl looked amazing in this diamond and emerald necklace, I had to take a picture. As I walked along with my grandmother Ellen, I spotted this young girl wearing this fantastic emerald and diamond number . I immediately ran over and introduced myself and asked for a photo for my blog. This Opal and diamond set was incredible! This entry was posted on July 26, 2015 at 9:05 PM and is filed under Nouveau Spotlight with tags Antique Shows, Art, Articles, Design Inspiration, Diamonds, Emeralds, Fine Jewelry, Harry Winston, New York, Theblack-nouveau.com, Tiffany's. You can follow any responses to this entry through the RSS 2.0 feed. You can leave a response, or trackback from your own site.